There is an explosion of local talent in town, and it is taking place at the beautifully restored, and very historic, Crighton Theatre in Conroe, Texas. No wonder it has been called the Crown Jewel of the County. I suggest you put on your tap shoes and head on over to enjoy the fun before the word gets around and all performances are sold out. 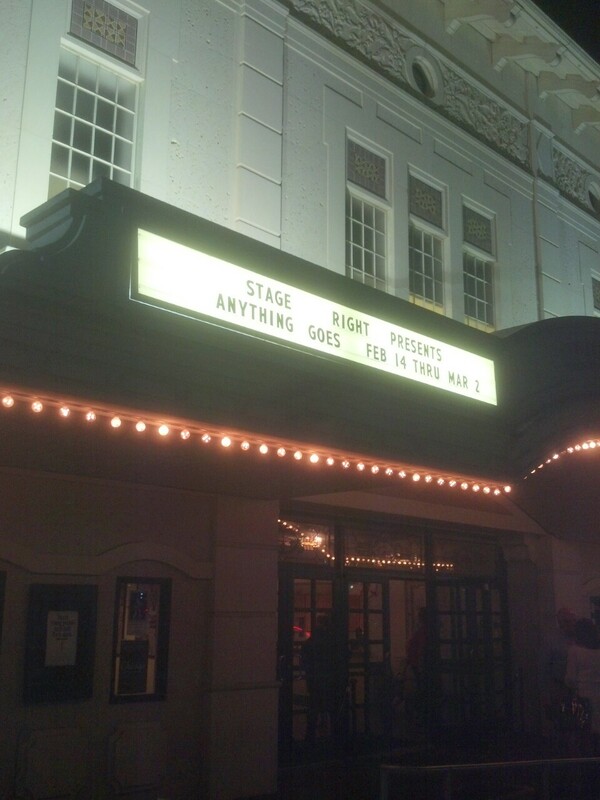 The pièce de résistance is the current dazzling Stage Right production of Cole Porter’s classic musical, Anything Goes. 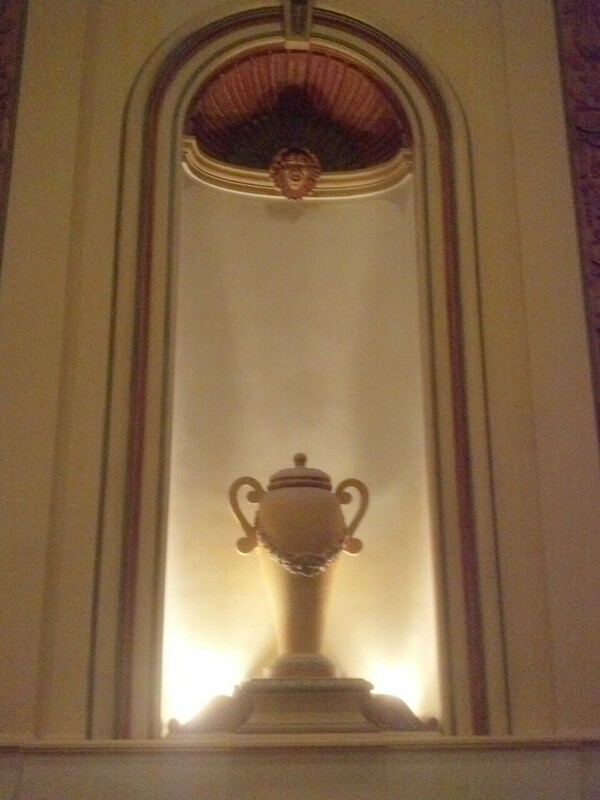 What a way to celebrate this 80th year for one of the few surviving Vaudeville theatres still in operation. And what a celebration it is! The zany plot of this cruise ship adventure in the 1930’s has too many twists and turns to summarize here, but believe me this show is not about plot. It is about the fabulous and enduring music and lyrics of Mr. Porter. But beyond that, this show is anchored by the wonderful dancing that is served up in this edition by Director/Choreographer, Randy Bianchi, Musical Director, Penny Andros and their brilliant cast. Amy Barnes designs the ballroom Choreography. 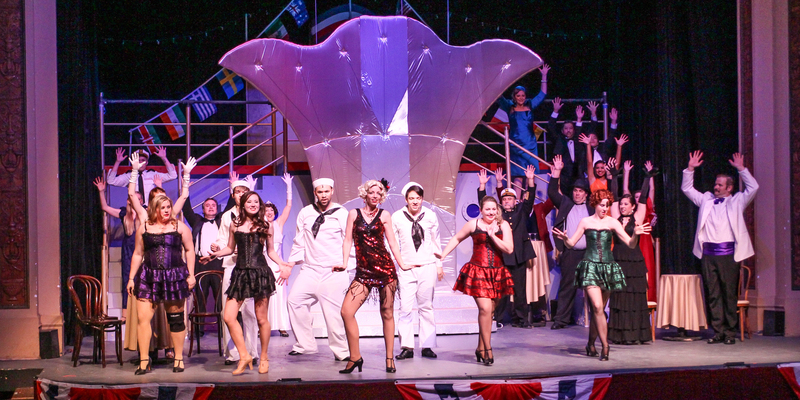 The action all plays out on the terrific two-tiered cruise ship set from designers John Barton & Denise DeBold, along with their fine scenic design and construction team. Minor set pieces move in and out freely. The delightful characters in this first-rate musical comedy include Billy (smooth-voiced James Hunter McMahon), a young stockbroker who should not even be on the ship, and Billy’s beautiful love interest, the lovely Hope Hardcastle (Christina J. Taylor with the voice of an angel). 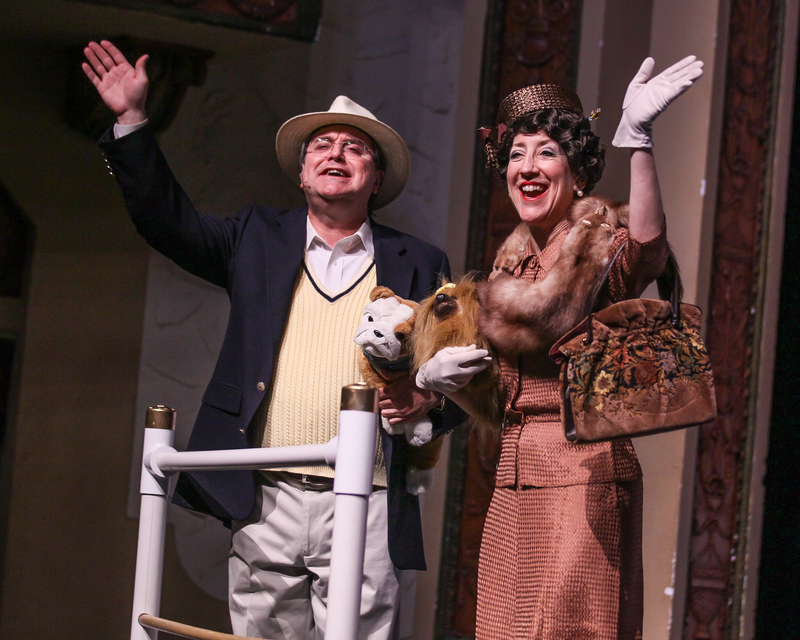 Hope is traveling with her wealthy English fiancé, Lord Oakleigh (a campy and amusing performance from Jonathan Rozas) and her social-climbing mother (comic fun from Carolyn Wong as Evangeline Harcourt). Billy’s stock market boss, Mr. Whitney (Phil Clarke) is sailing on the ship, but he thinks Billy is back at the office taking care of business. Adding to the onboard mayhem is nightclub singer, Reno Sweeney, played by talented Meaghan Schulz who could fill that bill quite nicely in a real nightclub. Reno has eyes for Billy herself. 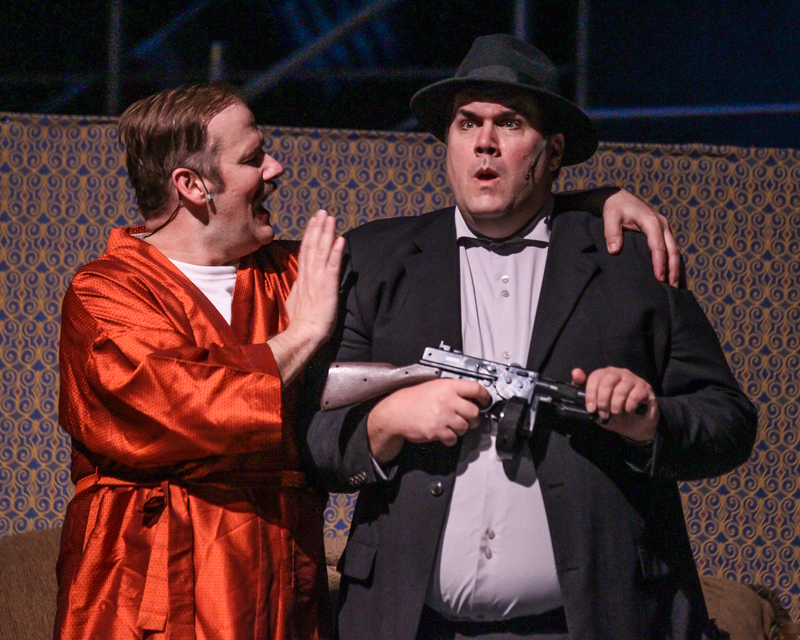 Then there is a riotous performance by Michael Raabe as two-bit gangster, Moonface Martin. Raabe really has the comic flair to keep the audience in stitches. That is but a glimpse of this enormous cast of some forty performers that are now thrilling audiences at the Crighton. But let us return to that bedrock of music and dancing I mentioned earlier. I had some minor misgivings at the outset because I am never a fan of recorded soundtracks supporting performers, but I must say in this case both orchestrations and synchronization worked out well and complemented the fine voices of this cast. Take for example Reno’s opener, “I Get A Kick Out Of You.” Miss Schulz looks sleek and sassy in one of the countless colorful and glamorous costumes (from designers Deborah Blake & Elaine Steinbach) that make the show so gorgeous from beginning to end. Billy joins Reno for a sparkling, “You’re the Top,” and then Billy and Hope do a memorable, “Easy to Love,” featuring some lovely dancing. Mr. Clarke delivers a rousing, “Crew Song,” and a Sailor’s Quartet has slapstick fun with, “There’ll Always Be a Lady Fair.” Schulz and Raabe offer a cute version of the tune, “Friendship.” Things move to an even higher level of excellence when we finally hear an exceptional “It’s De-Lovely” duet from Miss Taylor and Mr. McMahon. While the two danced divinely the audience couldn’t resist interrupting with spontaneous applause. 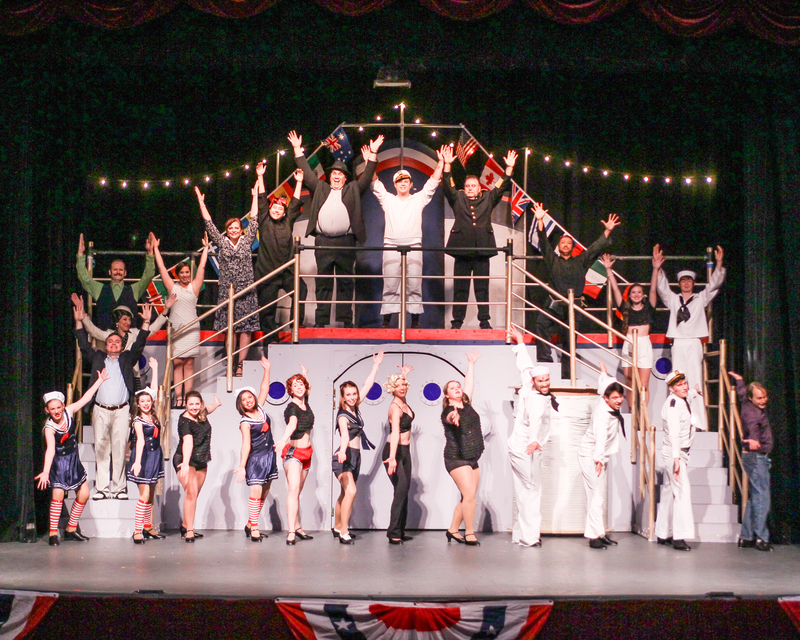 Act One would close with that “explosion” I promised you as the full cast joined in the tap dancing frenzy of the title tune, “Anything Goes.” The thrilling polish on that number has to mean this cast spent many winter nights at hardworking rehearsals. The result proved that the real star of this show was the full ensemble company itself, and sent the smiling audience off to Intermission in a state of amazement at the excellence of what had just been witnessed. A touch of irony opens Act Two as the performance in the ship’s showroom is celebrating the presence onboard of a “celebrity,” none other than notorious gangster, Moonface Martin. Mr. Raabe hams it up beautifully as the Captain (Dan Tippen), joins the Purser (Nathan Owen) and the cast to pay Moonface homage with the amusing, “Public Enemy #1.” Miss Schulz follows with another knockout punch leading her backup Angels in a terrific, “Blow, Gabriel, Blow,” that features wonderful singing from the ensemble and more stunning cast choreography. The excellence continues with the thrilling voice of Miss Taylor for “Goodbye, Little Dream, Goodbye.” Her lovely voice is here reminiscent of such musical stars as Kathryn Grayson and Jane Powell. 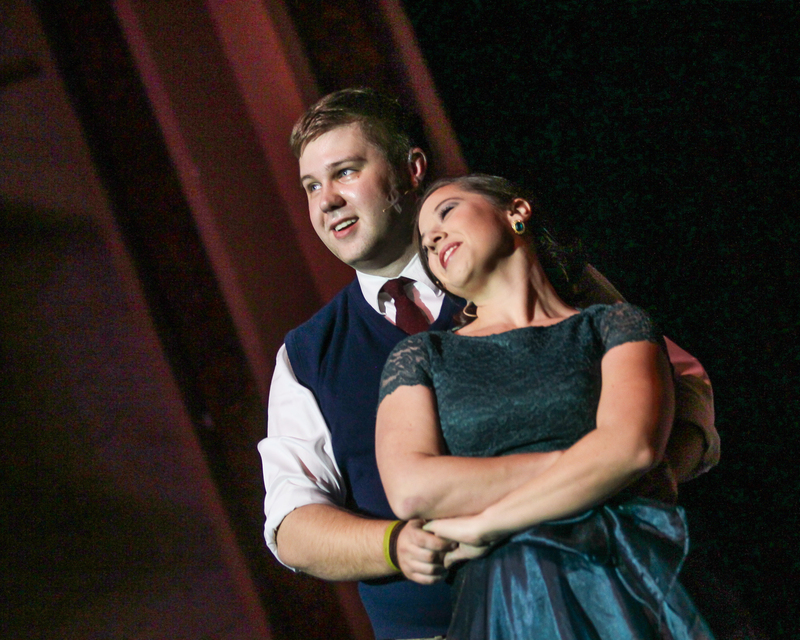 The glorious gowns in these scenes are yet another reason this is a must-see show. With the approach of a great finale there was a nice taste of the familiar comic flair of Carolyn Wong as the prim and haughty Mrs. Harcourt. Then it was on to another full cast explosion with the sensational, “I Get a Kick Out of You.” It was a final delight for an audience that clearly got a big kick out of this very wonderful show. Go see for yourself, and have your smile muscles ready. This entry was posted in Anything Goes, Broadway, BroadwayStars.com, Cole Porter, Conroe Courier, Crighton Theatre, Houston Community Newspapers online, The Courier Columns, ThePeoplesCritic.com, YourHoustonNews.com and tagged Anything Goes, Broadway, Cole Porter, Crighton Theatre, musicals, Stage Right Players. Bookmark the permalink. Another enjoyable review! Good job!